Everyone has their own idea of how to care for their collections. With Nippon I would say that the first thing is because of their fragileness, don’t leave them out where they can be broken. Place them in a cabinet or at least out of reach of children and pets. 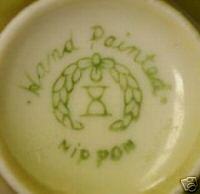 When washing this fine porcelain wash them one peice at a time in warm soapy water. 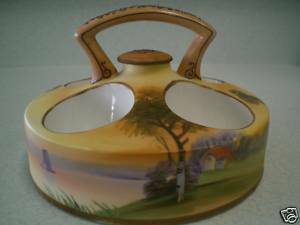 Do not use bleach on your hand painted items. Do not use silver polish, steel wool or harsh cleaners. Often your peices will probably just need a good dusting. Keep track of your acquisitions. I like to use an Excell spreadsheet. When you purchased the item and for how much. 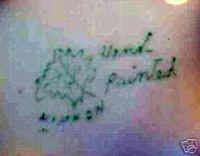 What is the description and backstamp on your peice. What is the value to you? Where did you purchase it? You may want to return to purchase more items, or if you decide to sell, the shop or person you purchased from may know someone else who had an interest in your item. I also keep my wish list on this spreadsheet with what I am willing to pay. If storing your collection, here are some do’s and don’ts. Never stack dishes on top of one another (even saucers) unless wrapped in tissue. 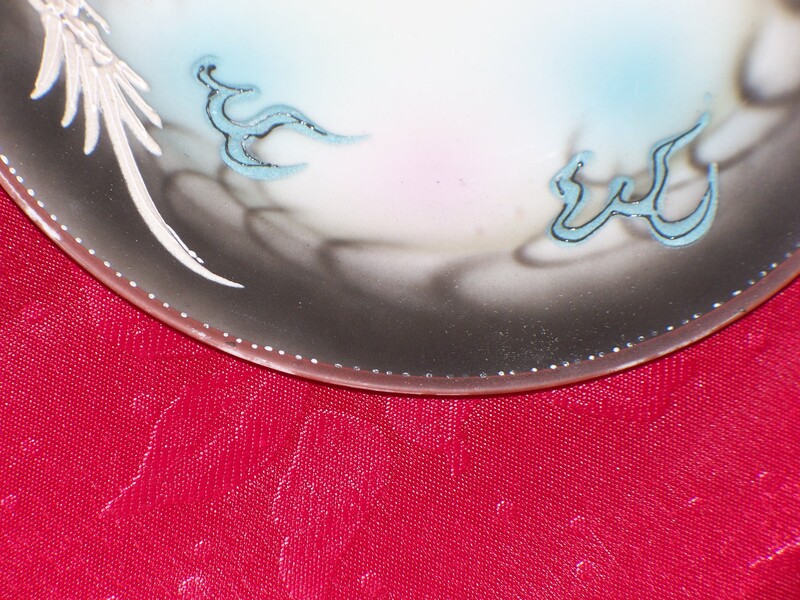 Dishes rub against one another and the paint will rub off on the edges. 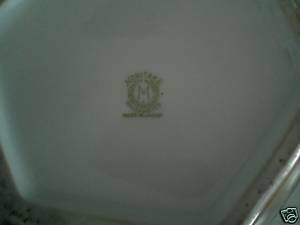 I see a lot of this on Nippon and Noritake especially in the saucers and plates. Don’t stack cups, they are fragile and will chip. Always wrap lids to teapots and sugar bowls seperately. Don’t hang cups by handles…their weakest spot. 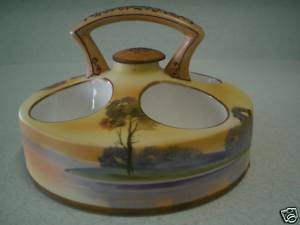 Take special care with your hand painted items because even if one little dot of paint is missing the peice is now damaged. Click on photo to enlarge: In the 1st photo you can see where paint has been rubbed off the edges. In the 2nd photo you can see dots of paint on the rim are missing. 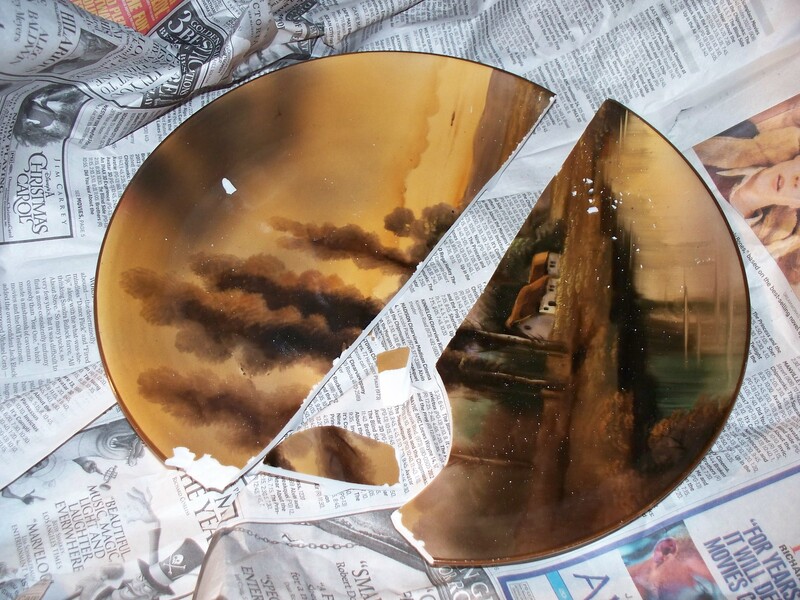 This is a damaged plate. Not in perfect condition. These dishes are actually pretty durable. After all many are over 100 years old with little wear. But occasionally we break or damage one and that is the end of that. 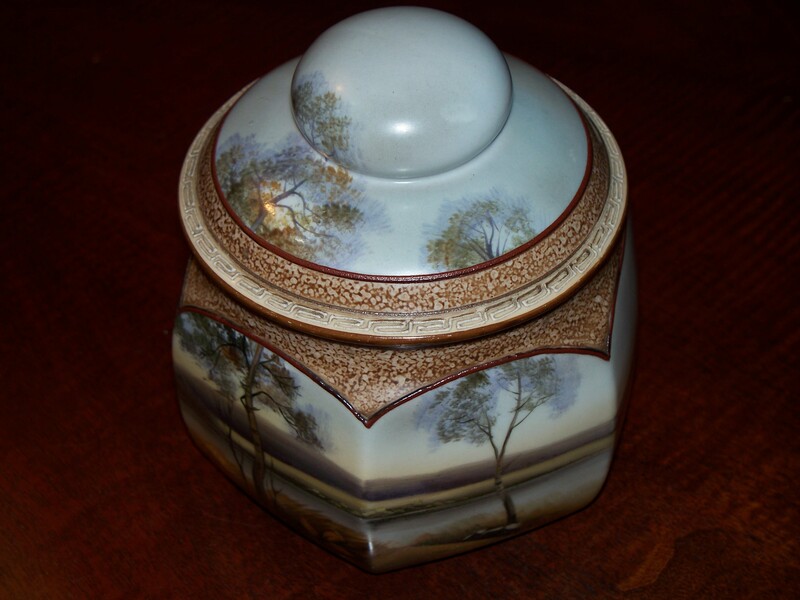 Once damaged if you want to repair give it to an expert who does porcelain repair. I have never had any luck at repairing myself except just to glue back together which is very obvious it is broken. 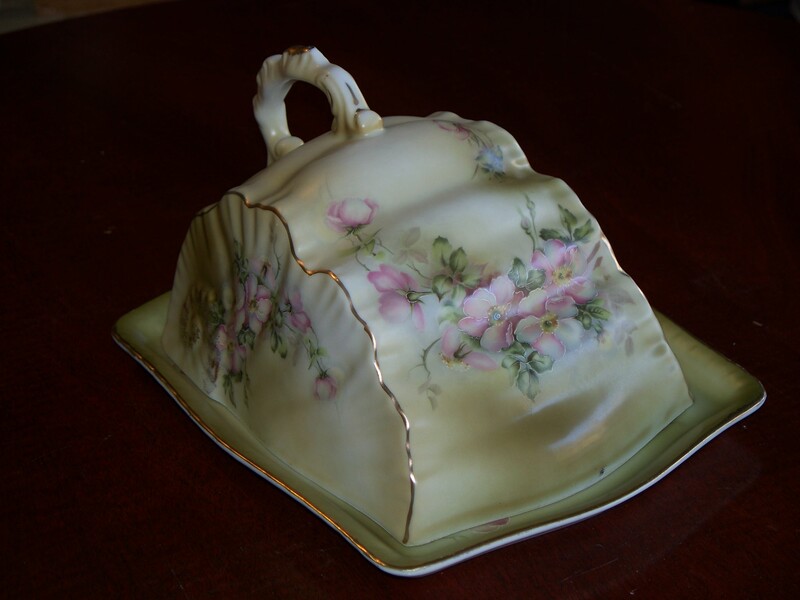 NEVER try to sell a repaired item without disclosing that it has been repaired. Always inform customers who buy from you damages to peices…it happens, or maybe you bought it damaged but didn’t realize it at the time. 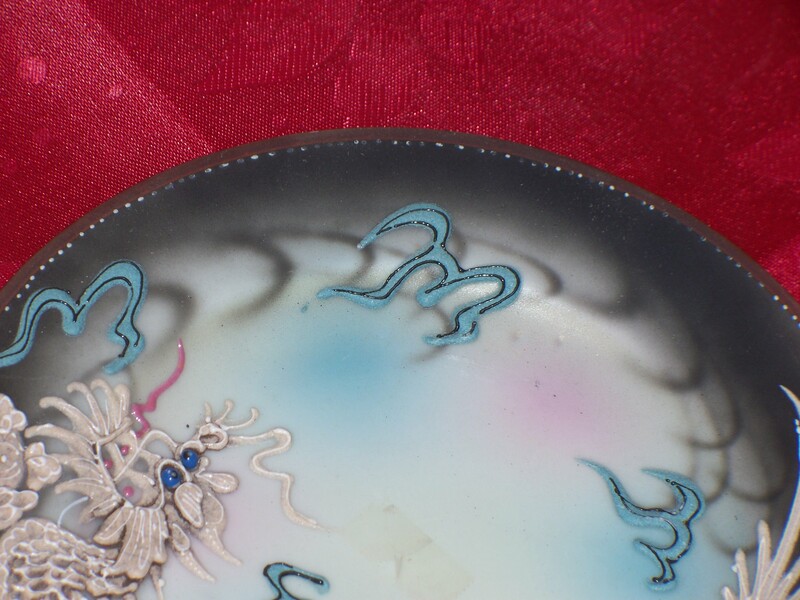 A beautiful “Nippon” hand painted plate broken during shipment. It happens! 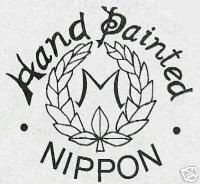 A very good reference author for Nippon is Joan F. Van Patten. She has written a number of books, articles and price guides and is considered an expert in this field. Over the last 5 post I have shown you many of the backstamps to look for. Here are a few that are counterfeit. These are all poor attempts at fake Nippon markings. Counterfeit. 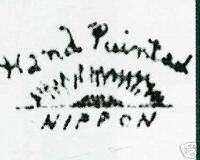 This is a marking found on Reproduction Nippon. 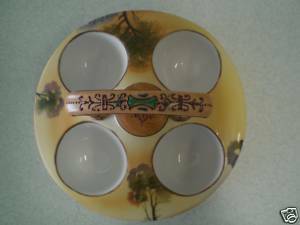 Reproduction Nippon is very pretty and as long as you know you are buying reproduction it is ok. I own some reproduction peices. They are very nice. Here are two of my most recent aquisitions. 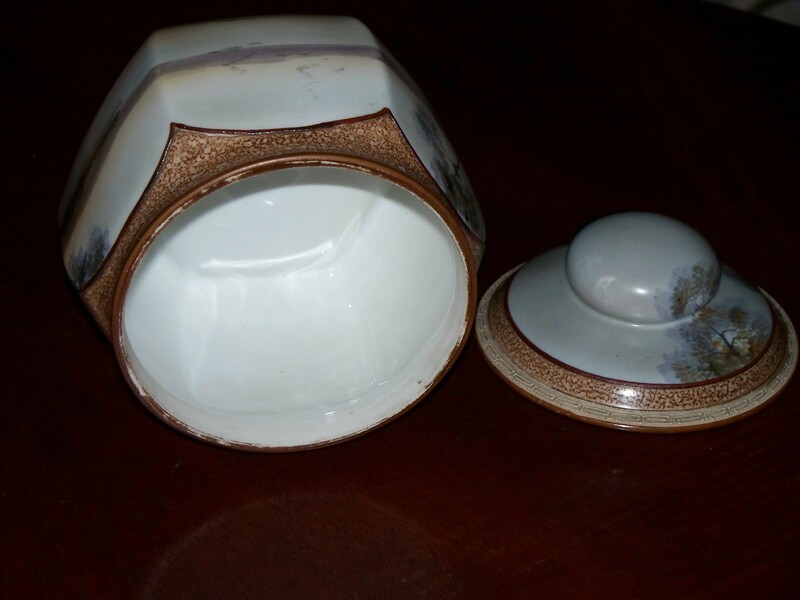 A Nippon egg holder and a Noritake humidor. In my next post I will talk about the traits that I think it takes to be a collector and that some things that you touch daily are collectible and worth much more than there intrinsic value and you don’t even realize it. You won’t want to miss my next post! Until then Happy Collecting and remember the best is yet to come.